Looking to Create VR Content? Start Here. At the present time, creating content for virtual reality is akin to navigating turbulent waters in the darkness. Creatives need to be bold, brave and resilient pioneers to truly stand out in this nascent market. How many of you can set up and work a 360° camera, let alone create a storyline involving a 360° setup that means stitching together all the different camera angles? Not many. Creatives have to invent the new rules of this game as they simultaneously master rapidly changing technologies. Not only do they have their work cut out for them but they also have to finance all this effort. Everything must be production quality lest audiences be turned off. It takes both a thick skin and an inventive orientation to survive this era as a creative, yet people are flocking to create new medium. Why? The opportunity is truly open and likely golden—with a little help from friends. Sophia Dominguez is the founder of AllThingsVR (allthingsvr.co), a weekly curated newsletter of the top VR news, innovators and content. She is also the Entrepreneur in Residence at Rothenberg Ventures for their second River Class. Eugene Chung, founder of Penrose Studios and former Oculus Story Studio head, wrote an excellent blog post about how the VR community should remain open and share so that we can learn from each other. As a testament to that, he shared a beta version of their Developer’s Cut of “Rose and I”, their first film. The current Oculus Story Studio head, Saschka Unseld, also wrote a blog post sighting the lessons they learned from making their first VR feature film, Lost. Sharing lessons learned is especially critical in these early days of VR so that indie content creators can generate better experiences that appeal to more consumers. Given VR’s promise and potential, companies are also building ties to creatives through offering technical support, funding and devices. They know they need to have skin in this game and to do that many are offering nice incentives and sweet accommodations. Last week, for instance, Samsung launched “Gear Indie”, a MilkVR channel dedicated to screening VR indie films. This affords these filmmakers an immediate distribution platform and can compete in the Wild Wild West of today’s VR. This Wired article explains Samsung’s strategy of developing a VR creation ecosystem, but a more selective, curated ecosystem than an open range of videos uploaded onto YouTube.” Gear Indie is their first step in this direction. In coming weeks, Samsung will add more videos to the Gear Indie platform and announce challenges designed to inspire creative solutions to both storytelling and technical problems. Samsung’s Think Tank team is also developing a “3D omni-view” camera that captures “true stereoscopic 3D”, will have the capability to stream content live and of course access upload all content to MilkVR. They’ve coined this camera “Project Beyond” and have recently opened up sign-ups for creatives looking to test out the first version of their camera. Adding to the fray, at I/O Google announced their “Jump” ecosystem, consisting of a 16 rig camera created in partnership with GoPro, software that transforms the 16 pieces of video into stereoscopic VR video and a player (YouTube). To apply for early access to the Jump camera rig, go here. The applications notes that select creators will get access by late summer, which technically is now! UPDATE (9/8/15 @ 8am): GoPro has started selling its “Odyssey” camera to professionals for $15,000. Those interested can register here. Tongal, a crowd-sourced studio, has also stepped into the VR content game by partnering with Nokia. They recently launched the “Look Around You VR Project”. The competition goal is to see which team can create the most mind-blowing 120-second prototype narrative VR short film that will features what Nokia’s new OZO VR camera can do. Nokia also has entered into a partnership with Jaunt that will bring access to their post production suite and allow use of its studios for content creators. The organizers of the VRTGO Conference and Expo also just announced that are teaming up with nDreams to create a VR contest for students and start-ups in the VR space. nDreams is the UK’s largest videogames developer solely focused on creating virtual reality videogames and experiences, and hopes that this competition will showcase up and coming VR talent through innovative content and technology for games. To apply, you must submit a 2 minute video or demo of the VR game you’re building and submit it by October 1st; the winner will get to exhibit their prototype at VRTGO event on November 12th and will receive mentorship from nDreams and the Sony Computer Entertainment Europe VR team. These kinds of creative-established tech company partnerships give content producers access to new cameras and other equipment so they can test out potential directions. Evocative of Google Glass’ Explorers program, this is a win-win because the larger companies see the results of the experimentation with their devices—opening up possible unforeseen adaptations and opportunities. EEVO, the company building the “Netflix of VR”, is a platform for high quality content. I spoke to Alejando Dinsmore, CMO, who said that they are working closely with top content creators who want to distribute their unique VR experiences on a high quality platform. To upholster this statement, after they raised $1M in funding, and have dedicated a third of its funding to commissioning and licensing content from the top VR content creators. To apply, simply reach out to them via email. WEVR, a VR media player for aspiring and professional creatives, launched a $1M VR Grant Program back in March to give aspiring creatives anywhere between $5,000 to $50,000 in project funds. With a recent $10M investment from HTC, creatives chances of getting some project funding for a great idea seem pretty high! If you are interested in applying to their program, go to their website here. Another supporter of the VR indie film scene is Kaleidoscope SF, which began as a meetup in 2014 and aimed to “build the VR film industry”. A year later, they are sponsored by: VRideo, AltspaceVR, Gear VR, Condition One, River Studios, Unity and others. Starting tomorrow, they’ll embark on a 10-city tour that will showcase their VR filmmaking and feature exclusive VR films made by independent artists. The Kaleidoscope Film Festival will screen 20 of the most innovative VR films from around the world. As reported by PSFK, the 2016 Tribeca Film Festival will feature its Storyscapes program for the fourth year in a row and is now seeking out virtual reality submissions for the event. Perhaps one of the films featured in Kaleidoscope Film Festival will make the cut and be shown at Spring Studios to creatives from all over the world! And film is not the only target: VR games are receiving a lot of attention too. Focused heavily on ensuring that there are enough VR games for a consumer launch, Oculus has created multiple initiatives to help fund indie game developers: the VR Jam series (the latest mobile VR jam wrapped up earlier this summer) and their new $10M fund for indie VR developers. The company’s first Oculus Game Jam back in 2013 offered $50,000 in prizes to seed content creation for the Oculus DK1, the first dev kit that catapulted the company’s success. They upped the ante with the Mobile Game Jam earlier this year, which produced a $1 million prize pool and lead to over 700 submissions. 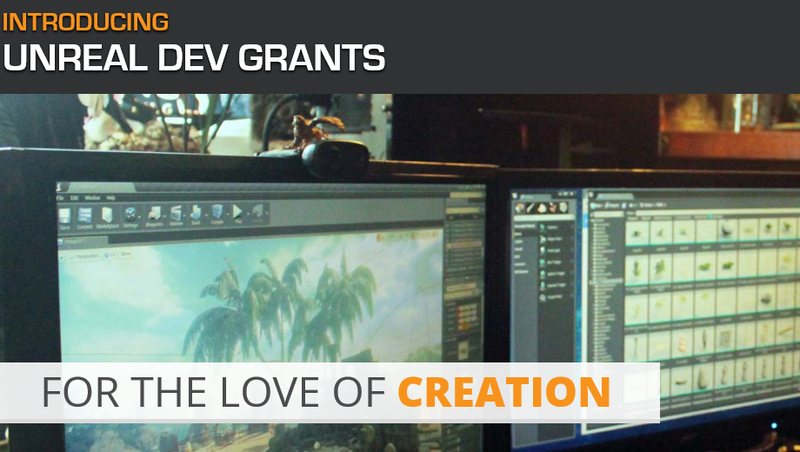 Back in February, Epic Games created “Unreal Dev Grants”, a $5 million fund to support inspiring projects built with or around Unreal Engine 4. By May, VentureBeat wrote a piece saying they had given away $500K through Unreal Dev Grants, which means they still have millions left in the fund. To apply, simply head to their website, tell them about your project and remember that it must work in or for Unreal Engine 4. Leap Motion is also focused on helping indie developers make some cash. They are in the process of setting up for their second 3D Jam, a 6-week competition for innovative experiences for virtual reality, augmented reality, desktop and mobile games or experiences. A grand total of $50,000 are to be awarded to entries on the AR/VR track, enough money to kickstart any team to creating a mind-blowing experience! Entries will be accepted until November 9, 2015 and you can apply here. Beyond content companies and other forms of grant money, traditional investment is also helping to pave the way for content creators. Firms like Rothenberg Ventures and Boost VC have both begun making small investment plays in their own VR accelerator programs. While small ($100,000 and $25,000 bets, respectively) these investments are vital for companies just beginning to try and plant roots. The money comes with mentorship and resources necessary to aid the companies in their pursuits as they try and ‘be like cockroaches’ as Philip Rosedale put it during UploadVR’s investor demo day. In sum, larger companies realize that the road forward for VR depends unequivocally on creatives. Creatives bring the innovation, energy and experimentation but for them to actually build a road forward they need partnerships that provide financing, free or subsidized marketing and devices and other forms of support. Without exciting content, all VR’s goggles and haptic devices will miss the mainstream mass market—just like VR did in 90s.